Just for fun, here is a screen cast of me creating a ‘hello world’ in Node.js, and publishing it as a new website in Windows Azure, all done on my Raspberry Pi in 3 minutes. I used SSH to get onto the Pi, just to make the screen recording possible. First, create your site, you can just do this in the portal or the command line as described in Scott’s post. Which will put a copy of the iisnode.yml in the same directory. Now deploy your site (using git or dropbox, or whatever!). 2013-04-12T10:43:25 Welcome, you are now connected to log-streaming service. If your site throws an uncaught exception, this will also show up. 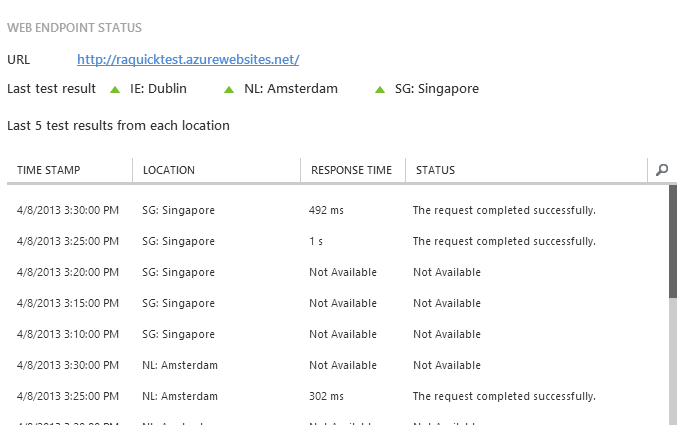 A new ‘web endpoint status’ feature recently appeared in the Azure portal to automatically monitor Azure Websites for you. The system will poll up to two endpoints for you, every 5 minutes from up to 3 locations (i.e. other data centres). You will get a warning in the portal if your application takes more than 30 seconds to respond. Your website must be running in ‘reserved’ mode to enable this feature. For me, 30 seconds is a long time. If your website is taking that long to respond, you’ve got a problem. I’d also like to monitor websites running in the free and shared modes. There are services out there which offer comprehensive monitoring, pingdom being the obvious example. However, I thought it would be interesting to roll my own.. I have chosen to only allow 3 seconds for the site to respond, this is just an option you can choose what is appropriate for you. You could also extend this code to monitor multiple sites. It writes out to the Mobile Services log every time it makes the request. The entry will show up as an error if the site returns an error. One advantage here is that you get far more history than just the 5 most recent pings. Following excellent work done by Thomas Conte and Richard Conway, I thought it would be interesting to get a Ruby application running in Azure’s PaaS – Cloud Services (i.e. a WorkerRole) in a really simple way. I have created a sample on GitHub, this article walks through the steps I took to set it up. Start by creating a Cloud Project in Visual Studio, and add a Worker Role. This will basically bootstrap the Ruby application. In the Worker Role project we’ll add the files we need deployed to the Azure machine. To install Ruby, I used the x64 Windows Installer from RubyInstaller.com. Download the installer and add it to the Worker Role project. On properties of this file, select ‘Copy to output directory’ -> ‘Copy if newer’ to ensure it gets included in the package. Add a script file ‘install.cmd’ to the project, ensure this is encoded as US-ASCII (anything but the default encoding for a text file in Visual Studio!) set the properties to ‘Copy if newer’. This will install ruby and the Sinatra gem. I had trouble getting Sinatra to work on the default port, but 8080 seems to work fine. I have put the example project on GitHub. This article is based on a recent NodeUp podcast dedicated to LevelDB, I recommend listening to it. I have played around a bit with Level, and I’ve been really impressed by it’s speed, ease and simplicity. You should give it a go. LevelDB was developed by Jeffrey Dean and Sanjay Ghemawat at Google. It is an ‘in process’ sorted key-value pair database. It persists data to the file system. This means that it works in a similar way to SQLite, in that the database is private to your process. Level is great if you want to create your own database (Riak for example) or you want to create a portable app that persists data itself (like Chrome). Node has some good support for LevelDB with two packages, LevelDown for low-level bindings to the LevelDB DLL, and LevelUp, a higher level abstraction (i.e. easier to use) over LevelDown. To get started, just install LevelUp. Using the options, you can iterate forwards/backwards, retrieve just the keys or values, and limit the number of keys returned. The double tilde as the end of the range ensures you get all the orders for ‘customer1’. There’s a few more bits of Level, including transactions and an event system etc… You can find out more on the GitHub readme. as i try to demonstrate in https://github.com/loveencounterflow/hollerith#lexicographic-order-and-utf-8, i consider using `~` as a field delimiter as snake oil / mediocre. you write, “As the keys in level are stored in unicode order, the ‘~’ (tilde) character seems to be a good choice for separating parts of a key”—well, first of all, LevelDB *itself* knows nothing about Unicode, only octets (bytes). it is the particular encoding you apply to your strings that define how your characters will relate to the ordering of keys inside the DB; as such, you can very well `npm install iconv-lite` and then apply whatever encoding comes to your mind. that could be an encoding where the latin letters are sorted as `AEIOUBDGFH…ZXY`. not that that would make sense in the general case, but still: LevelDB knows no Unicode. and yes, if your encoding is utf-8, which makes total sense, then you will get strings sorted in a lexicographic way *as if* sorted by Unicode character IDs (codepoint values). this is because although utf-8 is a variable-length encoding, it nevertheless does preserve the relative ordering of all encoded codepoints. next, your statement is somewhat self-contradictory: “because Unicode, `~` is good”. why? i’d say, “because ASCII, `~` is good”, because ASCII is 7bit and has `~` at position 0x7e (= 0b1111110), making it the highest printable codepoint of ASCII that will come after everything else in ASCII. but not in Unicode, where roughly 112’956 – 120 = 112’836 eqv. to 99.99% printing codepoints come *after* position 0x7e. the first time you enter a German, Swedish, French, Hungarian, Russian, Danish, … customer’s name as part of a key, chances are that any ÆÇÄÕÑ… will violate your assumption. why would you want to store data as opposed to (or alongside with) field names as a key? well, simply because that’s how you build indexes in LevelDB. if you don’t do that, you can never quickly iterate over all customers age 40 and older who live in Washington, DC or Århus, Denmark, which is, like, *the* classical DB application example.